250°F. Season the goat shoulder with salt and pepper. Heat olive oil over medium heat in a Dutch oven, add the shoulder and sear until golden brown on all sides. Add the garlic, onion, sage, bay leaf, and lemon peel. Add enough milk to reach about 3/4 the way up the shoulder; bring to a boil then reduce heat so that the liquid is no longer boiling. Place in the oven and braise until fork tender, about 2 hours. Remove the vegetables, herbs, and lemon peel and discard. Using a fork and a pair of tongs shred the meat, being sure to discard any large chunks of fat or sinew. Return to a simmer on the stove and reduce the braising liquid by one-half. Cook the pasta until al dente (about 4 minutes), drain, and toss with the shredded goat and milk. Season to taste with salt and fresh black pepper and serve immediately. Sift flour into a mixing bowl. Make a well in the flour and add remaining ingredients. Knead the mixture with your hands. Remove dough from the mixing bowl and place onto a floured surface. Knead for about 2 more minutes. Cut dough into two pieces and cover with a bowl or damp cloth and let rest for 10 minutes. (Allowing the dough to rest will improve its texture.) Roll out dough to strips of 3/8” thickness and 1/2” to 3/4” width. Flour the strips and run through a pasta machine creating the cavatelli. 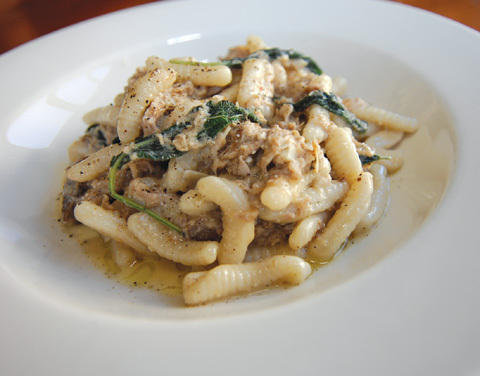 Chef’s recommendation is to use a Beebo Cavatelli maker.